OTTAWA — Erik Karlsson had a goal and an assist and Craig Anderson made 31 saves as the Ottawa Senators defeated the Arizona Coyotes 7-4 at Canadian Tire Centre on Tuesday. Arizona goaltender Mike Smith was injured and left the game at 7:18 of the third period. After a shot by Senators forward Chris Kelly hit the post and fell in the crease, Smith twisted back towards the net. He was helped off the ice without putting any weight on his left leg. Domingue made eight saves on 11 shots. Zack Smith, shorthanded, Bobby Ryan, on the power play, Kyle Turris, with his third goal of the season, each scored for the Senators, who lost 5-1 to the Detroit Red Wings on the road Monday. Mike Hoffman had three assists. Jordan Martinook had two goals and Tobias Rieder and Oliver Ekman-Larsson scored for the Coyotes, who played the first game of a six-game road trip. With the Senators up 2-1 and killing a penalty, defenseman Dion Phaneuf stepped up in the neutral zone to cause a turnover at the Ottawa blue line. Senators forward Tom Pyatt took the puck over the Arizona blue line, cutting around Ekman-Larsson on the right wing. He slipped a backhand pass to Zack Smith in front who had beaten Coyotes forward Shane Doan to the net through the slot and Smith put the pass in on the stick side. 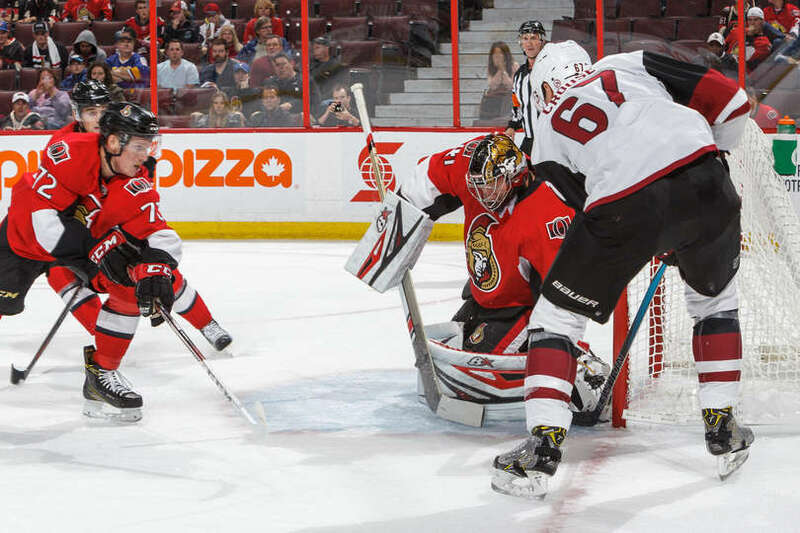 The Senators were ahead 3-1 with 45 seconds left in the second period when the Coyotes broke out on a 2-on-1. Martinook carried the puck down the right wing and opted to shoot. Anderson got his right arm on the shot to allow to make the stop. Twelve seconds after Domingue replaced Smith, Pyatt created a turnover in the neutral zone and forced the Coyotes back into their zone. Arizona center Martin Hanzal tried a backhand pass across the zone which was picked off by Kelly. He skated in and scored on a shot to Domingue’s stick side. Pyatt made a series of good plays that led to a goal, but his best was on Kelly’s goal to make it 4-2. Pyatt jumped in the air to knock down a Coyotes clearing attempt just outside the Arizona blue line, absorbed a hit from Radim Vrbata and kept control of the puck which he returned deep into the Arizona zone. “He’s a good friend and first of all, I want him to be okay. You never want to see anybody be hurt like that. He seemed to be pretty sore, so hopefully, he’s alright. None of us know yet. You never want to see that.” — Coyotes captain Shane Doan on the injury to goaltender Mike Smith. “After [Smith] goes down, they get two quick ones and that’s tough. With Louis coming in there, you can’t fault him on any of those but they get the two quick ones and we’re pretty much out of it, we’re just chasing.” — Coyotes forward Jordan Martinook on what happened after the injury to Smith. “You never want to see someone get hurt. I hope Smith is all right. I was just unlucky with the shot, and [he was] unlikely with how he went down. But it was nice to get that second chance shortly after.” — Senators forward Chris Kelly. “We’ve got some guys who aren’t competing as hard as they need to compete. When you do that, you’re not going to win many games.” — Coyotes coach Dave Tippett. “Last night we laid an egg. There wasn’t much positive to bring out of that one. So it was nice to play back to back. You don’t usually hear guys say that, but it is when you go through a game like Detroit and you have a chance to bounce back at home.” — Senators forward Zack Smith. Karlsson scored the 102nd goal of his NHL career, the most by a Senators defenseman. Karlsson moved past Wade Redden. … With his two points, Karlsson moved past former Senators forward Marian Hossaand into sixth place on Ottawa’s all-time scoring list with 392 points. … Shane Doan’s assist was his 550th and tied him with Dale Hawerchuk for second place on the franchise’s all-time list. Thomas Steen is first with 553. … Coyotes rookie center Dylan Strome, the No. 3 pick in the 2015 NHL draft, made his NHL debut and got his first point, an assist. Coyotes: At the Montreal Canadiens on Thursday (7:30 p.m. ET; SN360, RDS, FS-A, NHL.TV). Senators: Host the Tampa Bay Lightning on Saturday (7 p.m. ET; SN360, SN1, SUN, NHL.TV).